Every other Saturday the Peabody Museum hosts family programs, where children can interact with their parents in a well-disguised educational setting. This Saturday’s diversion was particularly sugar-coated. 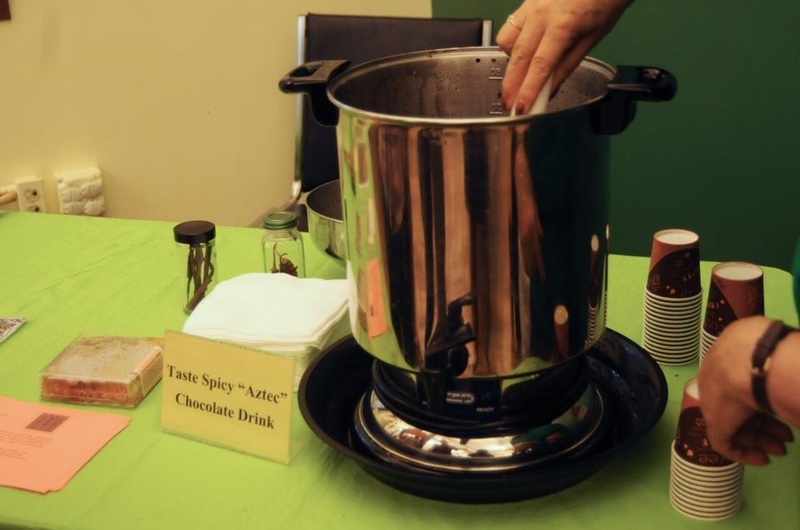 Hosted jointly by Taza Chocolate and the Peabody Museum, the event welcomed curious children, hungry parents, and a herd of chocolate fanatics in an exhibition called “Chocolate! From the Maya and Aztecs to Us.” Kids colored in drawings in the shape of Mayan ruins and taste-tested Taza’s delicious Mexican chocolate. Meanwhile, Roving Reporter attempted to milk the crowd for information, but as parents shook their heads and steered their children in the opposite direction, RR came to see that the event’s ending would be bittersweet. RR: So what is this drink? GB: This is Chilean hot chocolate. It was the traditional Aztec ceremonial drink, which only the priests and lords were permitted to have. The Aztecs used the cacao drink for religious ceremonies in the same way that we use wine. RR: Did it get them drunk? GB: No, it was a sacred drink that was non-alcoholic. The French started all that stuff later on. RR: They say life is like a box of chocolates—you never know what you’re going to get. You box the chocolates, so you know exactly what we’re going to get. How does it feel to have that kind of power? AW: I don’t feel like it is power. I’m just a craftsperson who makes chocolate at the Taza factory on Windsor Street. There are twenty of us. RR: Oh. How many kinds of chocolate do you make? AW: Around twenty different kinds. Gaujillo Chili, Cinnamon, Vanilla Bean, Coffee—all kinds. We also make chocolate covered almonds and cashews. All our chocolate is dark. It’s all organic, all kosher. RR: What got you interested in chocolate?